On 8 June 2012, the High Resolution Stereo Camera (HRSC), operated by the German Aerospace Center (Deutsches Zentrum für Luft- und Raumfahrt; DLR) on board ESA's Mars Express spacecraft, acquired images of a region inside the Argyre Impact Basin, which is 1800 kilometres across and five kilometres deep. This basin was formed as a result of a gigantic meteorite impact during the early lifetime of Mars and is the second largest impact basin on the planet; the Hellas Impact Basin is the largest. The name is derived from the Greek word for silver (argyros). The renowned Italian astronomer Giovanni Schiaparelli named this bright region on Mars in 1877, adding it to the detailed map he was producing at that time. The name alludes to the 'Silver Island' at the mouth of the River Ganges in Greek mythology. 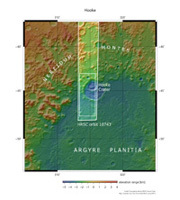 The images presented here all show part of the northern floor of the Argyre Impact Basin; the floor of the basin is referred to as Argyre Planitia. It is easy to identify Hooke Crater, 138 kilometres wide and named after the English physicist and astronomer Robert Hooke (1635-1703). 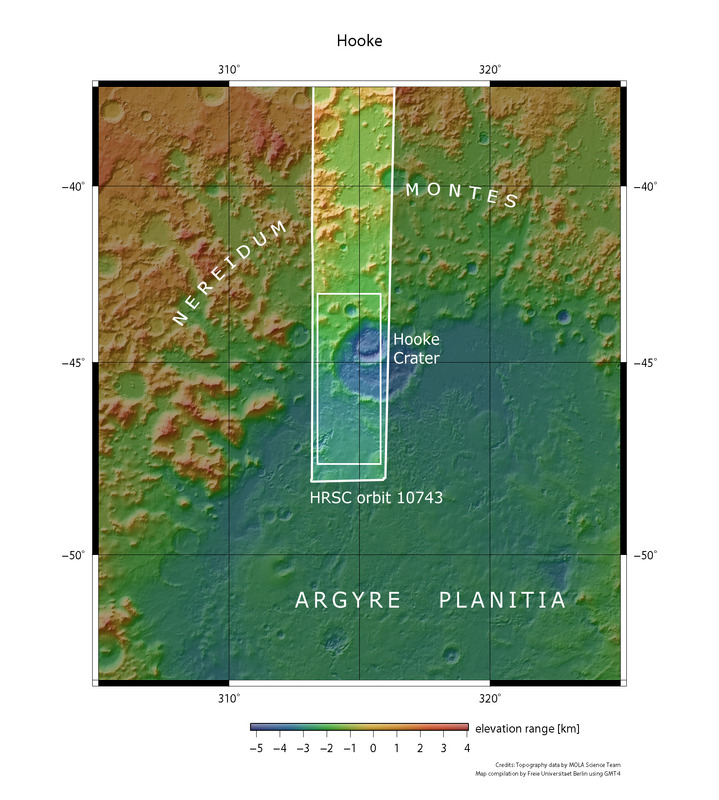 Large areas of Argyre Planitia have been modified by wind erosion and by the influence of water and ice. This gives rise to the rounded appearance of the landscape surrounding Hooke Crater. Inside Hooke Crater, constant wind activity has formed dunes, whereas the linear structures lying to the south of the crater, known as 'yardangs', are the result of wind erosion. These are readily identifiable in the colour plan view (image 4). The most striking feature in these images is the thin layer of carbon dioxide ice (dry ice) that extends across the southern part of the crater, as though it were dusted with icing sugar (to the left in image 4). Carbon dioxide ice occurs frequently on the surface of Mars. For a long time, it was assumed that it only formed as frost at ground level, as depicted here. However, NASA's Mars Reconnaissance Orbiter recently discovered clouds made of carbon dioxide 'snow' that can deposit this snow on the Martian surface. Some years earlier, Mars Express had already detected clouds of carbon dioxide ice crystals. It is striking that, in contrast to the plain south of Hooke Crater (left in the colour plan view, 4) and some places inside the crater, which are clad in a thin layer of ice, this ice covering is absent from the crater wall facing northwards. The ice here was probably melted by the Sun; this view is supported by the time of day when these images were acquired. The images were acquired at about 16:30 local time during the winter solstice on the southern hemisphere of Mars. At this time, the Sun would have been only some 20 degrees above the horizon and would therefore only have had the time and energy to heat the northern slopes sufficiently to melt the ice there. It would not have been able to melt the ice located on lower-lying horizontal surfaces. Schiaparelli would undoubtedly have enjoyed the extraordinary images acquired by the Mars Express spacecraft, which continue to provide modern-day scientists with spectacular data. The images acquired with the HRSC were captured during Mars Express' orbit 10743. The image resolution is about 22 metres per pixel. The images show a section at 45 degrees south and 314 degrees east. 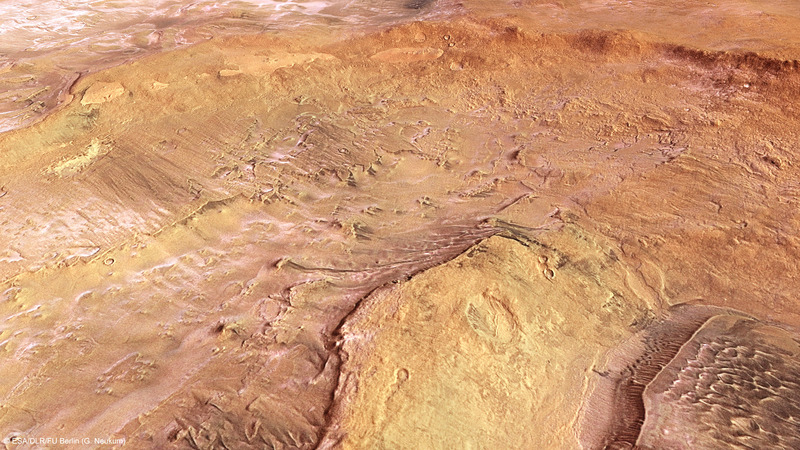 The colour image was acquired using the nadir channel, which is directed vertically down onto the surface of Mars, and the colour channels of the HRSC; the perspective oblique view was computed from the HRSC stereo channels. The anaglyph image, which creates a three-dimensional impression of the landscape when viewed with red/blue glasses, was derived from the nadir channel and one stereo channel. The colour coded plan view is based on a digital terrain model of the region, from which the topography of the landscape can be derived.